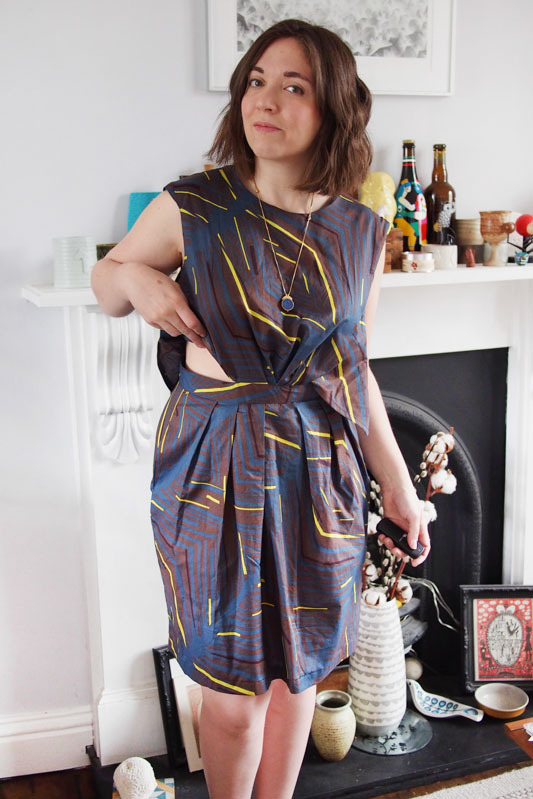 Sometimes I swear to remake a pattern again and it doesn’t happen for a long time, if ever, but in the case of Vogue 1501 I had such a ~vision for a black midi version that I went out hunting for fabric to make it happen immediately, and spent last week sewing it up. Added 6 inches to the length of the skirt plus knee-high side seam splits. The fabric is black ‘powder touch’ polyester from The Textile Centre in Walthamstow. The pattern does work well in a crisp cotton like i used last time but I think it’s especially nice in something drapier. 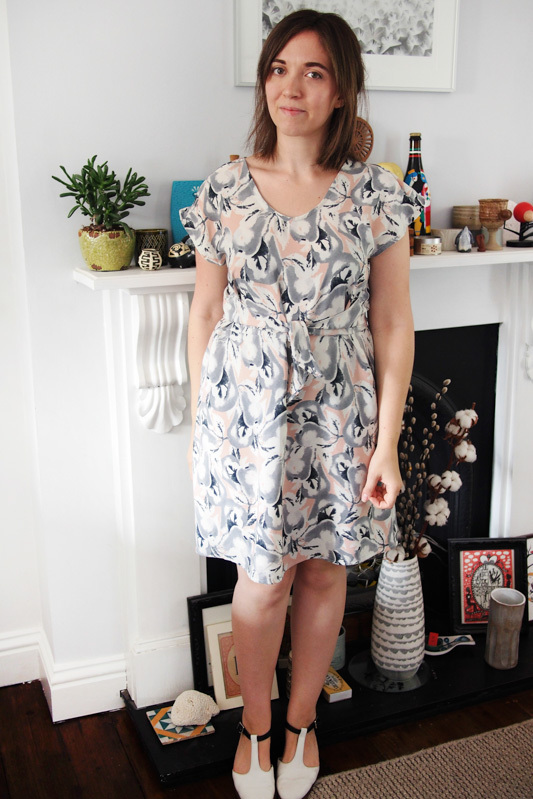 Despite being a bit out there for my usual style (I’ve never owned a dress practically ankle length long) I bloody love this dress and feel really comfortable in it. I feel like it will join the ranks of things I’ll reach for on those ‘I’ve got nothing to wear’ days, and the poly fabric will make it really easy to care for. I’ve been going through a sewing slump this month. The willingness is there, but the time and decision-making is not. 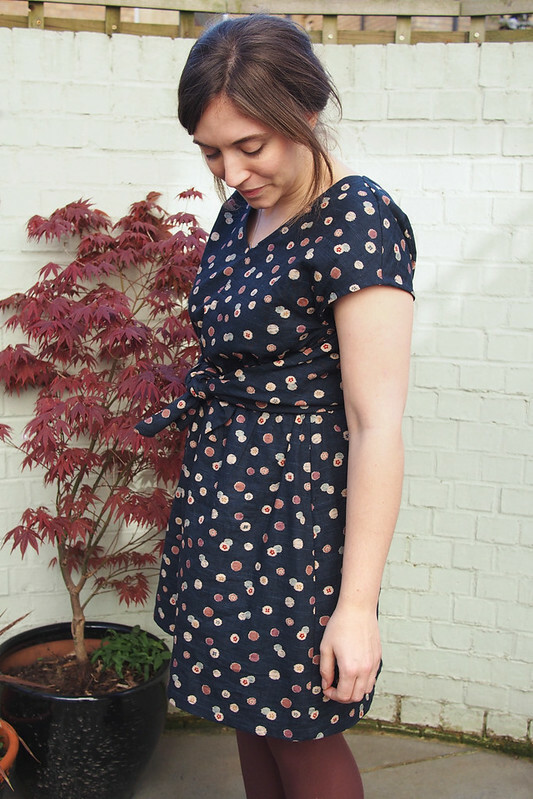 I’ve been buying up a few springlike fabrics and patterns to try to kickstart some motivation, and a recent Jaycotts sale landed me with the lovely new season Vogue 1501 amongst others. 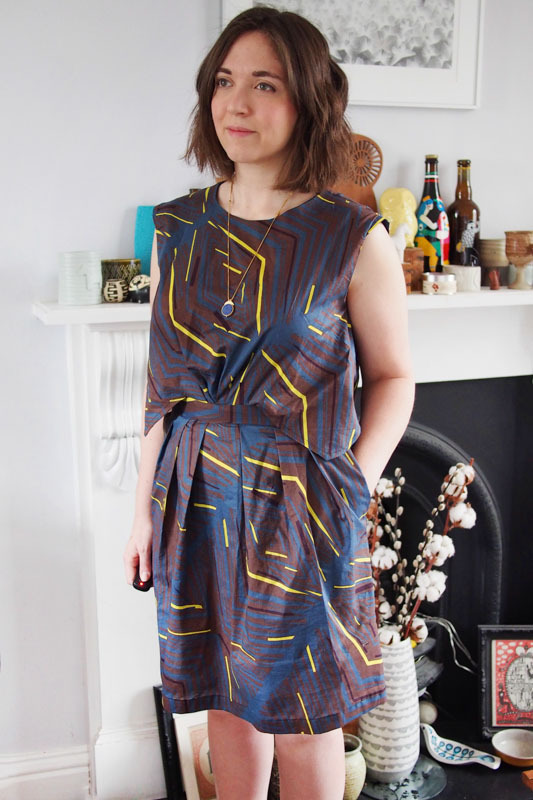 I plucked it out this weekend, and it totally worked: this was a heap of fun to make and sew and I have a nice new spring wardrobe garment ready to go. 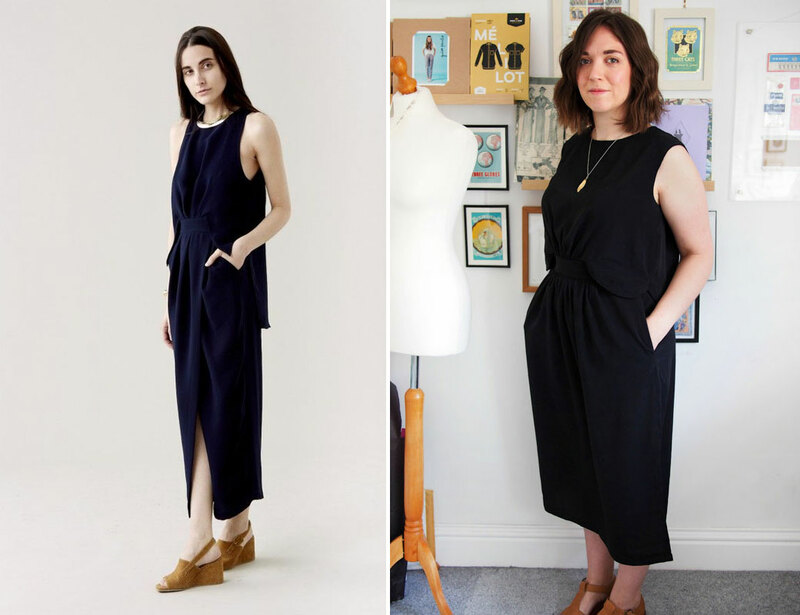 V1501 is a Rachel Comey designer pattern. 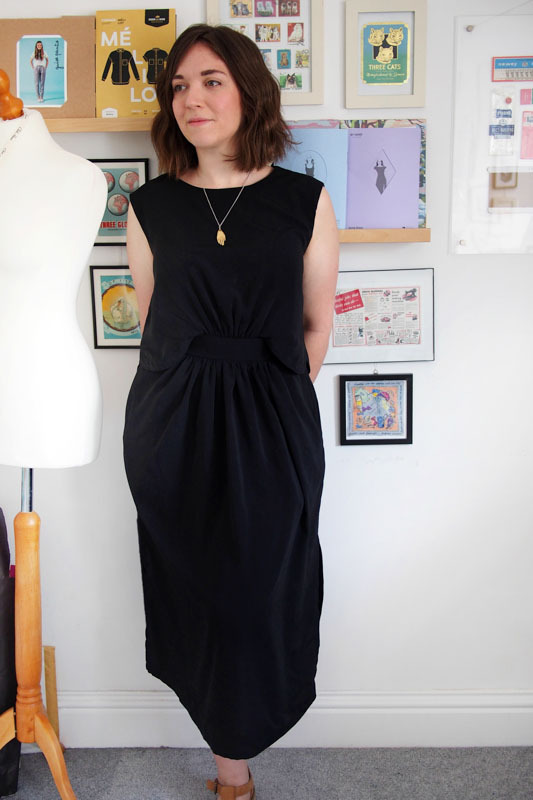 Here’s the pattern art (which is apparently usually one of the actual RTW dresses from the designer’s line) and another similar dress currently on sale at rachelcomey.com (now I want an ankle-length black version, stat). Similar to my last finished garment it’s an illusion top-and-skirt style, with the bodice only joined to the skirt at the front waistband. I didn’t toile because the pattern pieces looked about right: I cut a size 12 from shoulder to waist and 14 in the skirt, and tucked 3/4″ out of the bodice length. The key fitting point to get right is the waistband really as the bust and hips are loose. 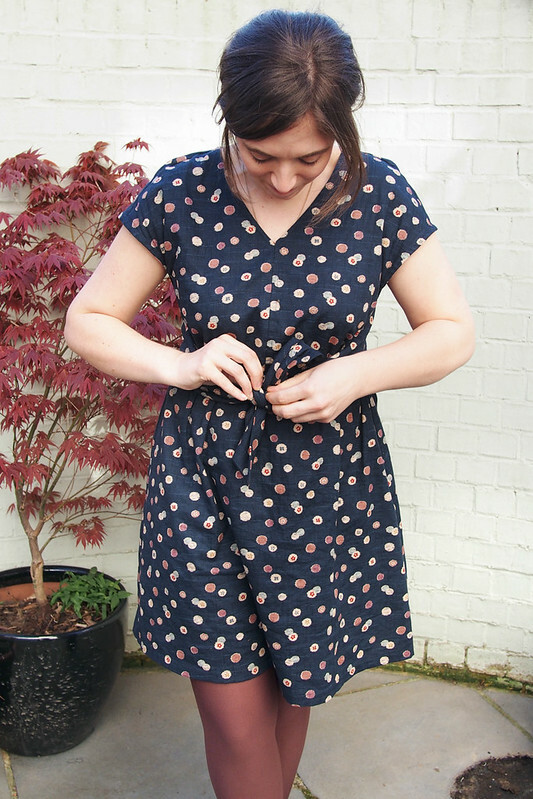 The fastening is an invisible zip at the centre back waist plus a button loop at the back neck. I can’t get over how good the fit is through the shoulder/upper chest/back with no adjusting: this never happens to me in Big 4s! Are the designer patterns cut to a different block? However it’s a little tight through the bum: darted back skirts never do that well on me. · Removed the deep inverted pleat on the centre of the front skirt; instead cut the pattern piece on the fold on the pleat line. Not a fan of masses of volume around my middle. 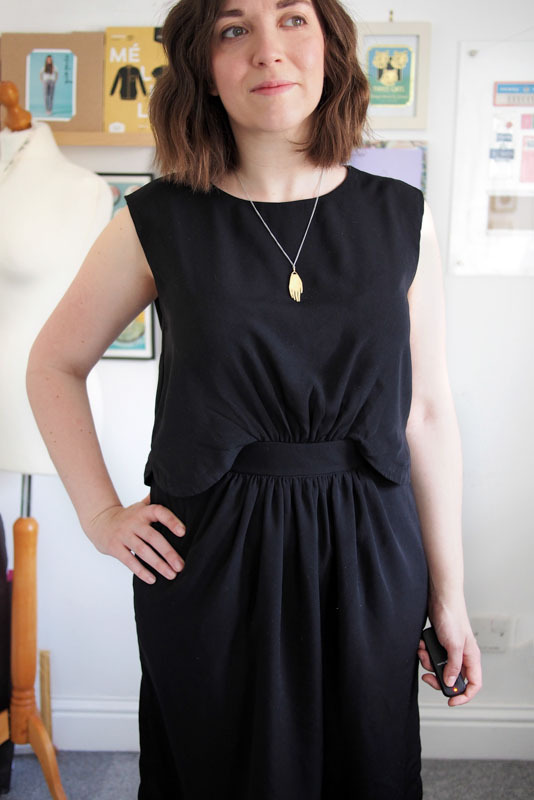 · The shoulders have a strange ‘gusset’ piece to add height, into which you’re supposed to slip a shoulder pad. The American footballer vibe is not my thing, so I sewed the gusset in flat instead for a tiny cap sleeve effect. The construction reminded me of my beloved Vogue 1395: nothing overly taxing or tricky, but some satisfyingly fiddly little steps to work through. Zen sewing at its best. I put my trust in the instructions, which were mostly pretty good, though I found it a bit weird that you get directions to French seam the skirt pockets but no clue on how to finish the rest of the skirt side seams. So I had to hastily overlock them afterwards. I especially appreciated the all-in-one facing unit to finish the neck and arms being sewn in my preferred way, which takes longer but gets a really lovely smooth result. 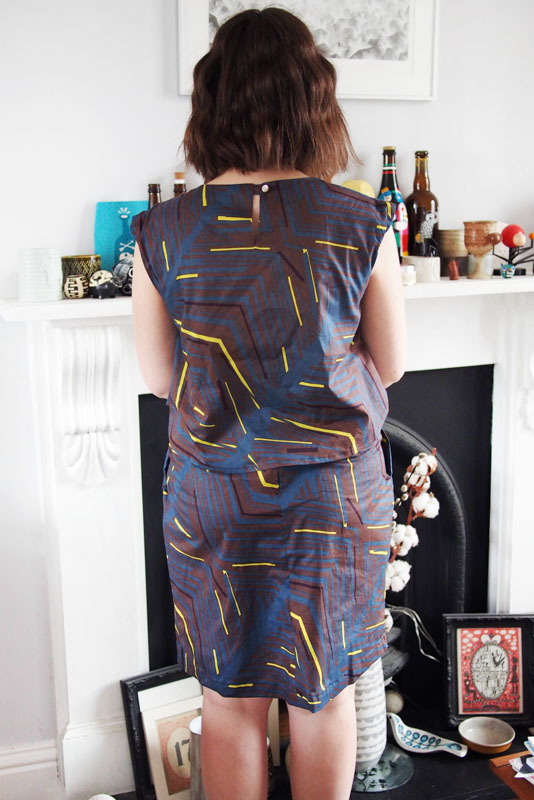 This fabric has been kicking around in my stash for ages; it’s a lightweight cotton from The Man Outside Sainsburys in Walthamstow and was a good match for the pattern. (I hear tell there’s another Walthamstow meetup next weekend so I’m looking forward to seeing what TMOS has in store these days.) I definitely want a solid version in black or navy next to try and emulate the lovely RTW version above. Meh. You know when you make something that should be perfect on paper but you feel ambivalent or disappointed with the finished result? Sadly that’s the case with this dress. 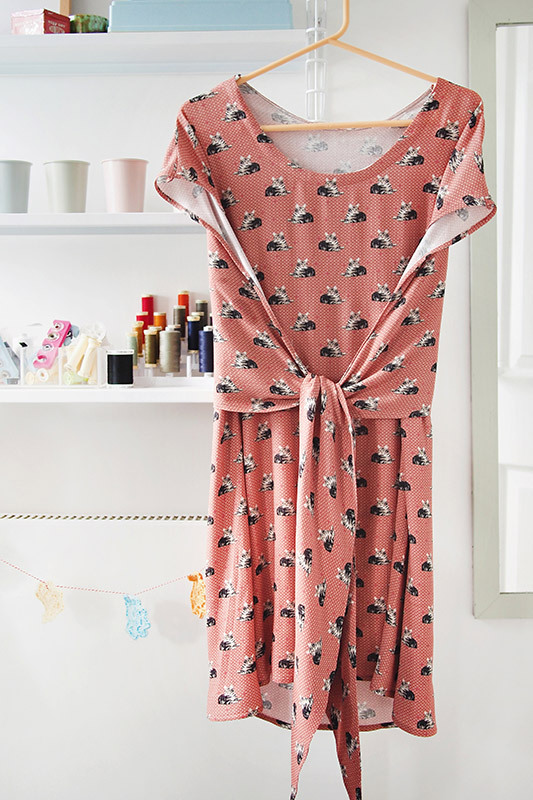 I mean, it’s a TNT pattern and cat print fabric! How did it go wrong? 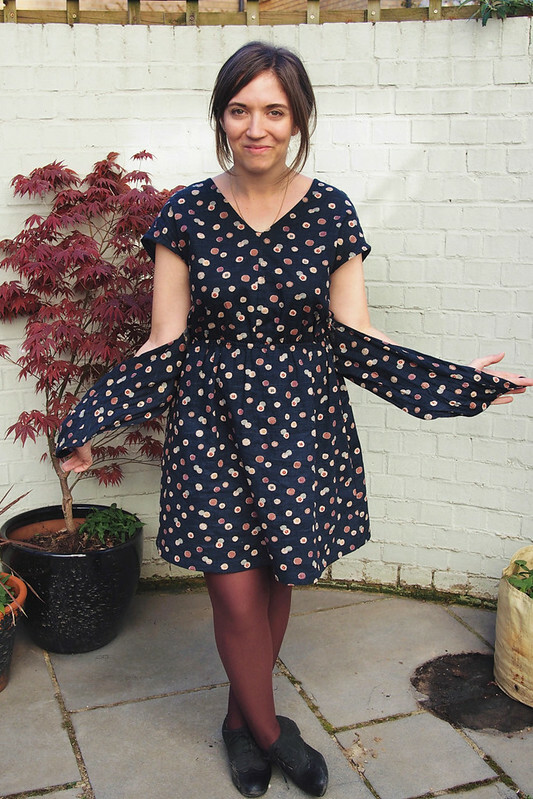 This is my fourth Vogue 1395 dress, and I really thought it’d be a quick win of a weekend sew. While I can roll all the multiple hems in my sleep now, I managed to make a catalogue of stupid mistakes while sewing this up. 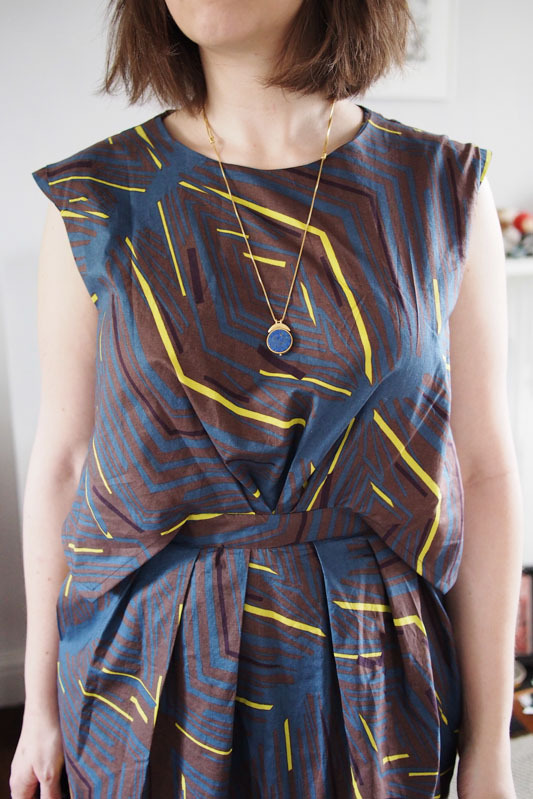 I ripped and sewed the shoulder seam a total of four times due to sewing it inside out – twice – and then realising the whole dress was pulling to the back, requiring an urgent forward shoulder adjustment, the first attempt at which I also sewed inside out. 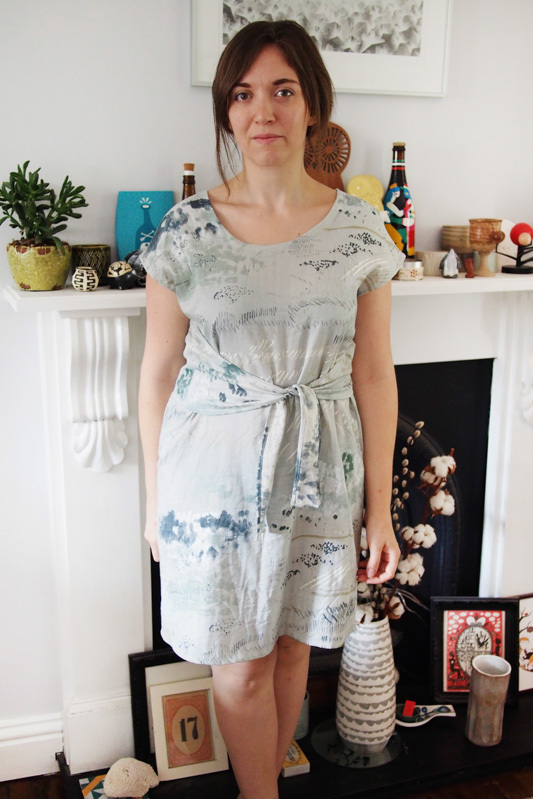 And please avert your eyes from the hem pulling up perilously at the front. I dunno what’s going on there. The whole balance just seems to be off, which I haven’t encountered on any of my other 1395s. Perhaps because this is quite a heavy creped polyester with a bit of crinkly stretch, so likely my cutting was inaccurate and the extra weight in the overlay is pulling the whole dress backwards. 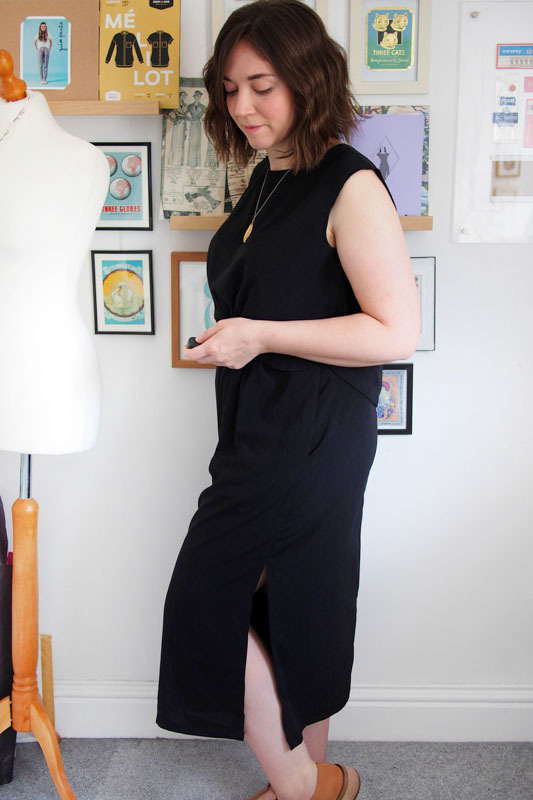 It just doesn’t feel too comfortable to wear unfortunately – it feels like it constantly needs adjusting and the obvious wrong side of the fabric keeps peeking out. Even the kitties don’t look impressed, do they. 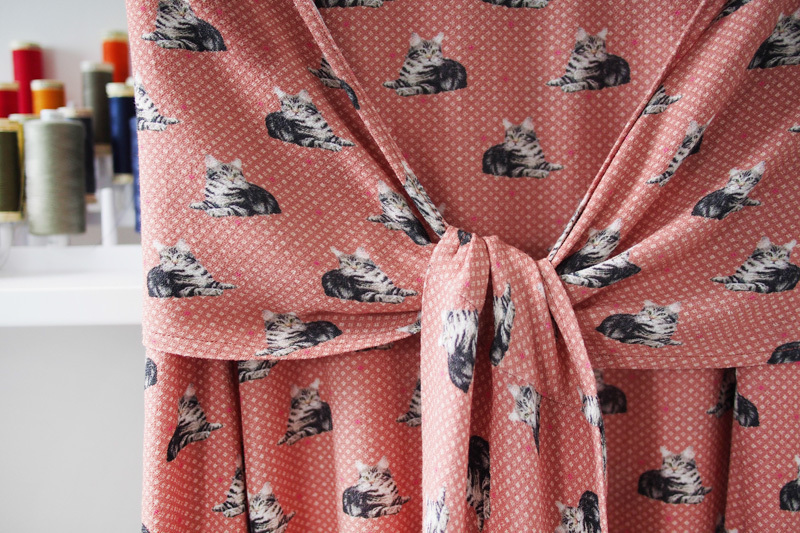 I’m crying that it didn’t work out as planned for such an awesome fabric (a Walthamstow market find). 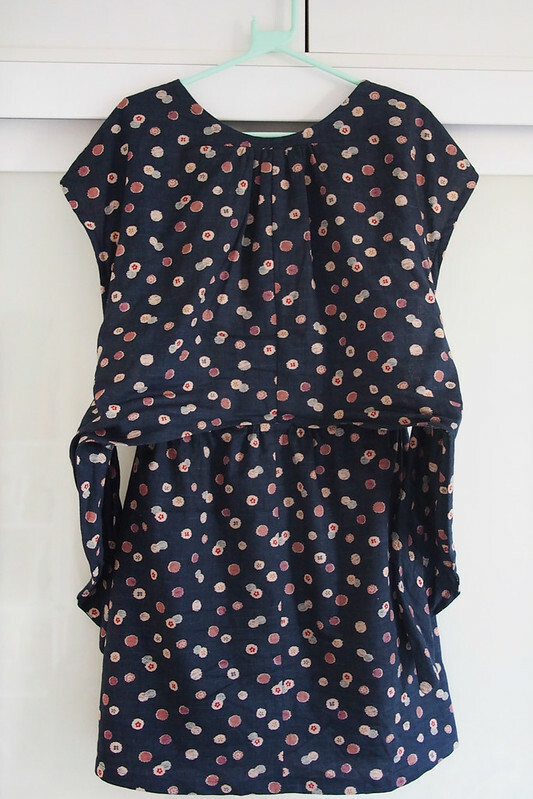 It might just be that this dress and I need to cool off a bit after a less than pleasant sewing experience. I’m going to stick it in the wardrobe for a bit and perhaps try pulling it out again come autumn to try with tights and boots – it might be more successful that way. Ah, sewing. Just goes to show that even when you think you know what you’re doing, something can come along to trip you up. 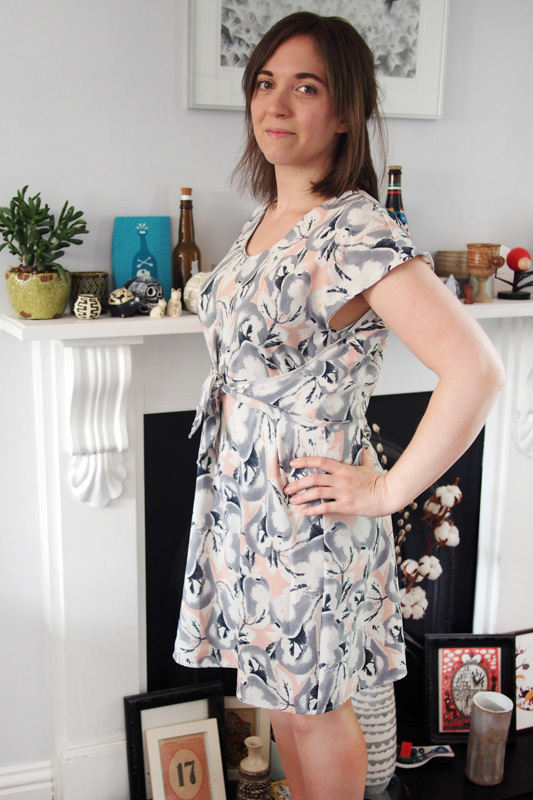 Here’s that third take on Vogue 1395 that I mentioned last time, fresh off the hand-sewing needle! 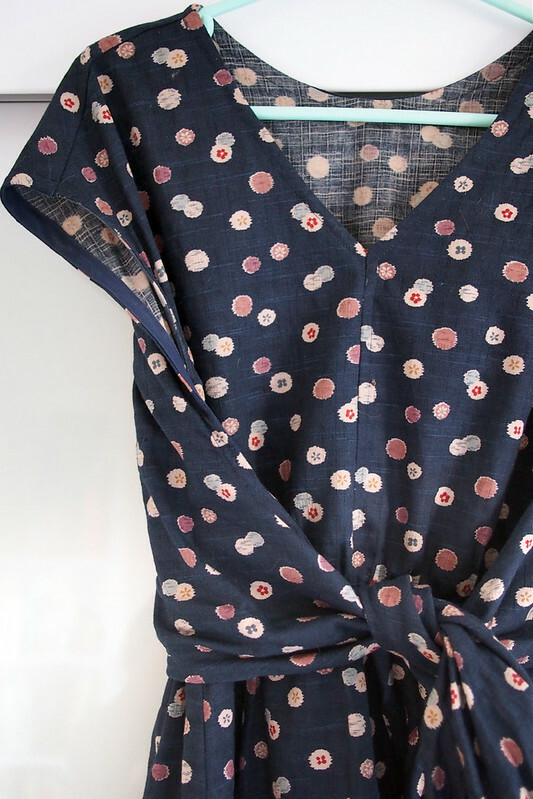 As you can probably tell if you’re a fabric dork like me, this one is made in a super gorgeous Nani Iro double gauze. I bought the fabric from Purl Soho in NYC. This pattern is called Spectacle; a sort of very abstracted painterly print of fields, bushes and clouds. It’s utterly beautiful – some of the white is thickly laid on to give it texture and there’s even some metallic mixed up in there. Cutting it out was a bit nerve-wracking, mostly because I only got 2yds and it’s quite narrow, so I really had to squish the pieces on a bit. 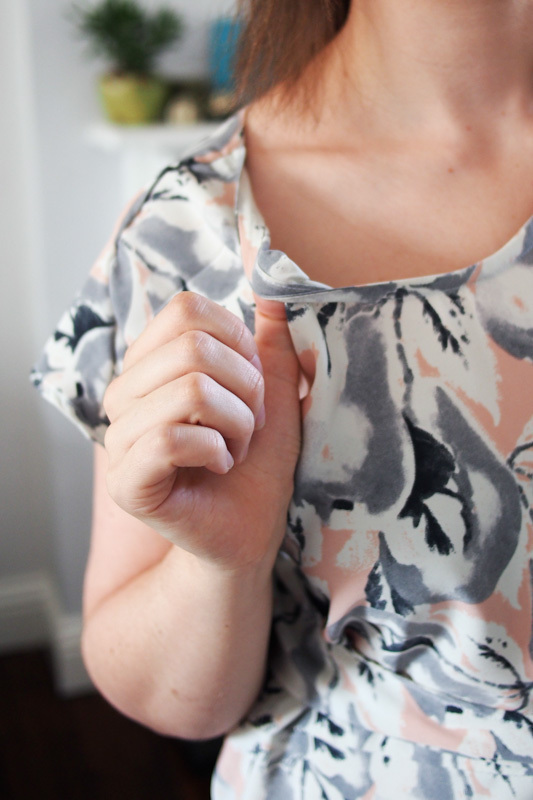 The print placement is quite lovely on the front but I had to make a seam up the back and it’s not quite so pleasing. As I mentioned before, during the cutting stage I merged together the bodice and skirt at the waist seam and cut both the front and back as single pieces. 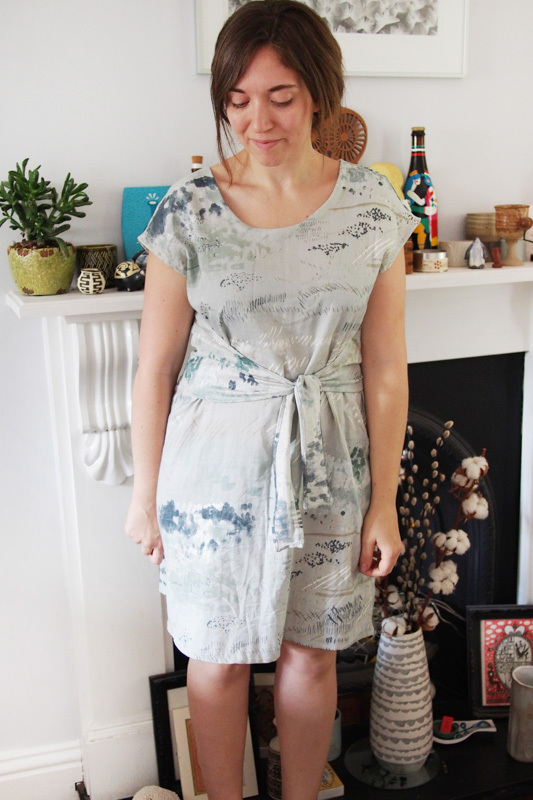 I found on both my previous versions of this dress that the wraparound overlay doesn’t necessarily want to sit exactly over where I placed the waistline seam, so removing it completely means the tie can naturally find the right place to sit on my waist. 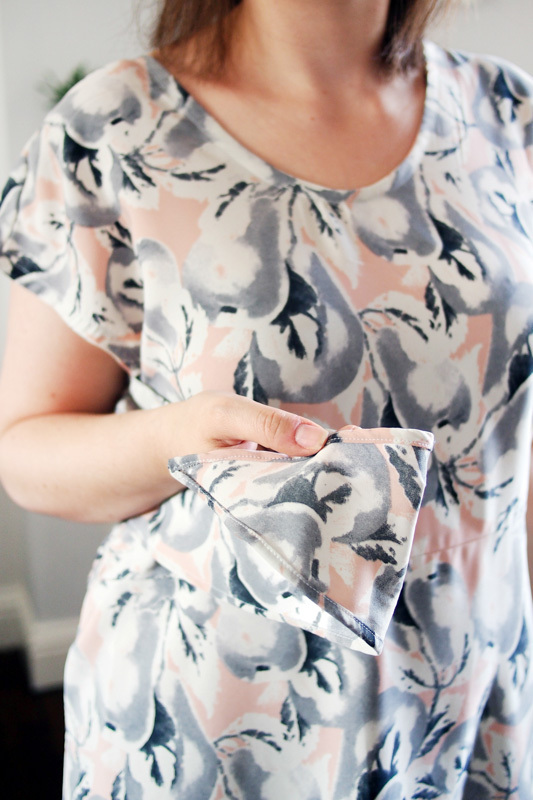 You then can’t catch the centre bottom edge of the overlay into the waist seam at the back, so it’s hanging completely loose and only joined at the shoulders. I definitely didn’t do any photo outtakes where I flew around like Superman with a cape. Nope. 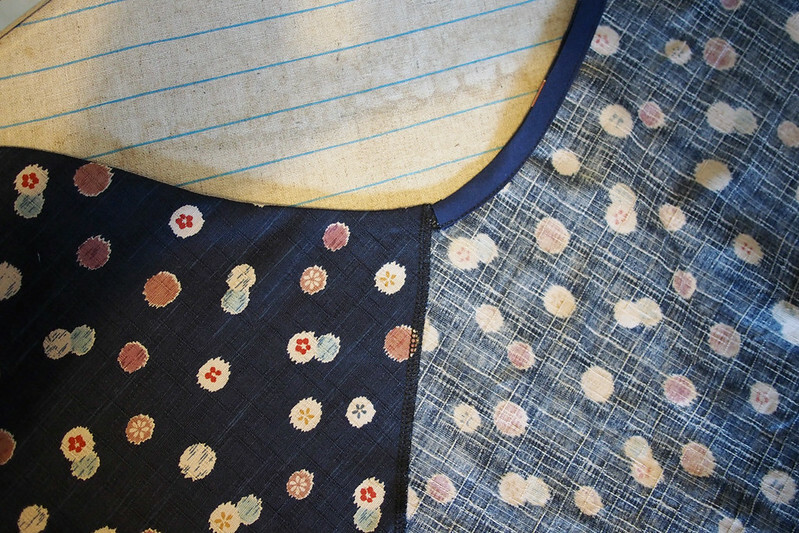 I treated the lovely fabric to a bit of rare hand-stitching: catch-stitching to secure the neck bias facing in place and to roll-hem the armholes and skirt hem. My patience didn’t extend to hand-rolling the entire overlay edge – that’s serged, folded back twice and topstitched as I did before. (Not purely laziness by the way, I also figured machine stitching is more secure for the area of the dress that gets stretched and knotted.) Making single fold bias binding is a bit of a nightmare with double gauze, by the way – I had a wobbly, distorted mess with the layers trying to separate themselves and frayed edges all over. But I did enjoy the catch-stitching because you can only pick up the inside layer of the gauze so it’s totally invisible from the outside. Mmm, satisfying. I still don’t feel like I’ve got this dress out of my system – there’s 3 or 4 more fabrics in my stash I think it’d be amazing in. By the way, it is Minerva Crafts’ pattern of the week which means it’s 50% off right now… I’ve had a lot of people tell me they’re tempted to make their own now, and I can only encourage you. 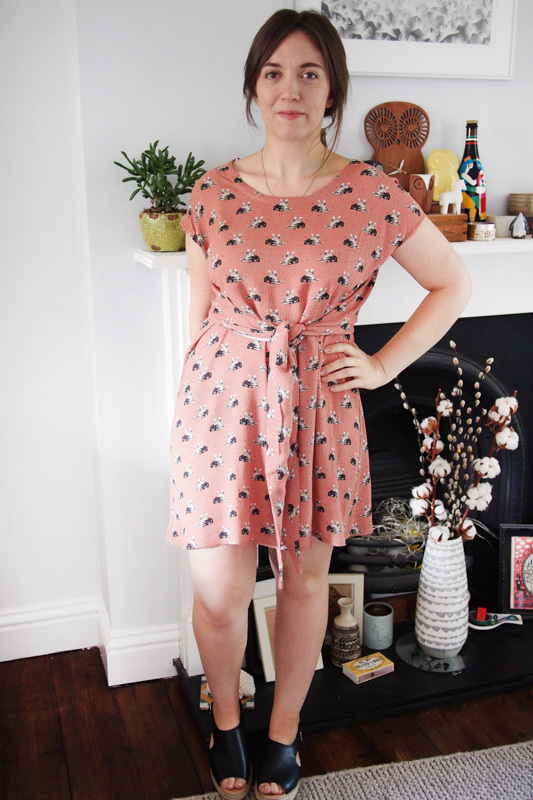 I recently picked this pattern to remake a bit at random, because it’s just so fun to sew and fills a wardrobe gap for slightly fancy summery frocks. It’s my second take on Vogue 1395 (here’s the first). 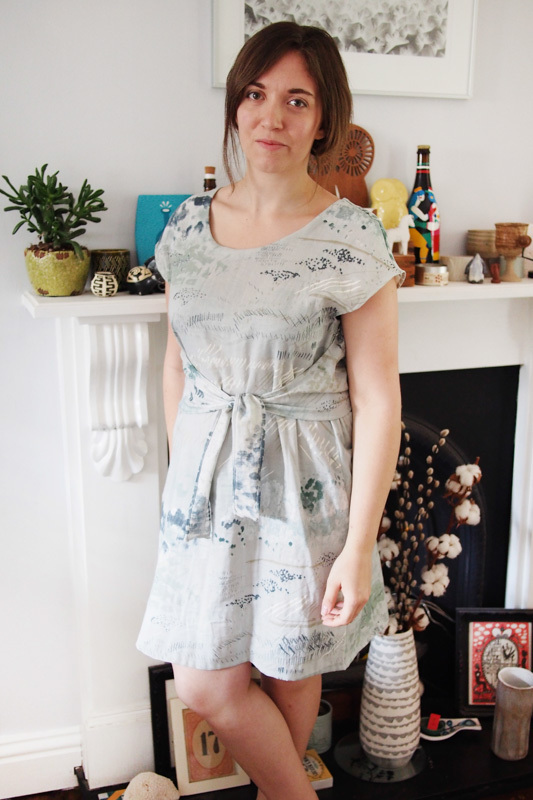 I wanted to put into practice a couple of minor fitting and design tweaks from last time, as well as trying it in a drapier fabric which it’s better suited to. That makes a pair of 1395s, and this one has pears on, ho ho. Besides the fit alterations I made first time, this time I cut front bodice on the fold and did a U-shape neckline instead of the V, added in 1/2″ bodice length (after I removed too much on my first go) and slimmed down the overlay ties a little bit – I did not have enough fabric spare to make them any longer as I wanted to. Gah, I adore that wraparound side view. 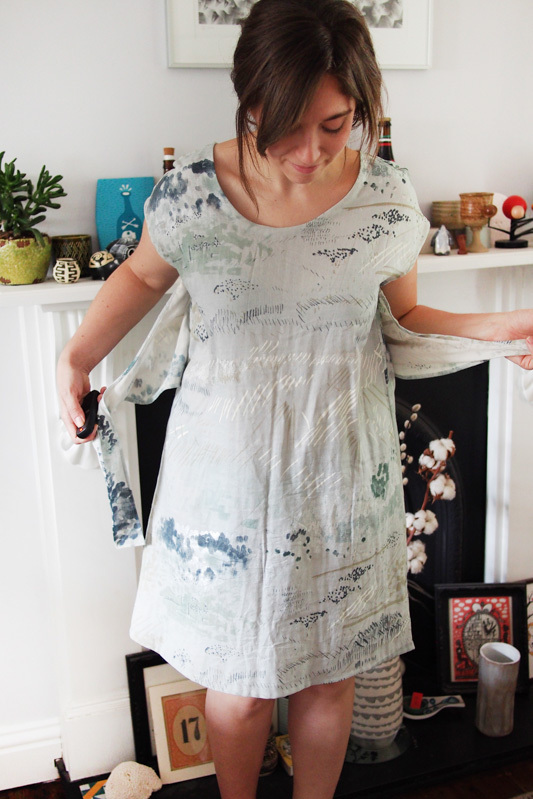 I left the sleeves full and fluttery this time as it seemed to suit the fabric. Personally I find this pattern very flattering on my pear (ho ho, part two) shape because the wide shoulders and slim skirt do a good balancing act. 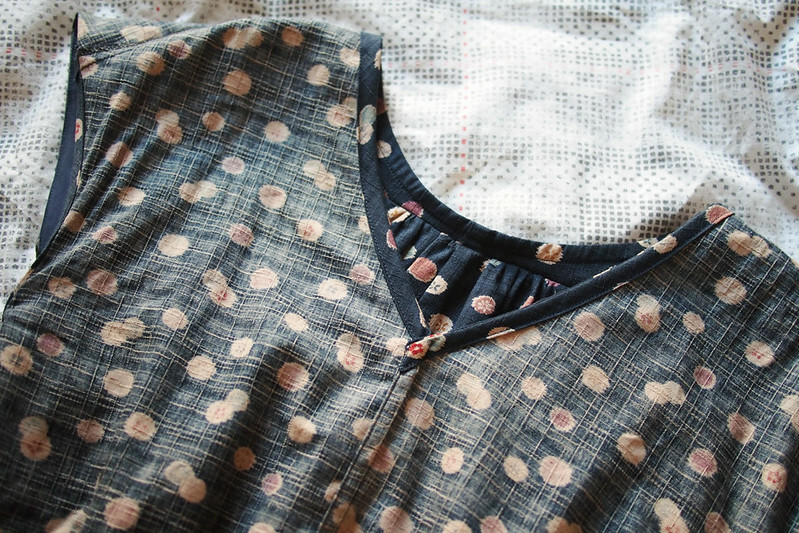 I made self-bias tape to finish the neckline and armholes, and did cheatin’ roll hem for the overlay/tie edges and hem: serged the edge then used that as a guide to turn back twice and stitch into place close to the fold. A bit dirty, but turned out looking quite neat. 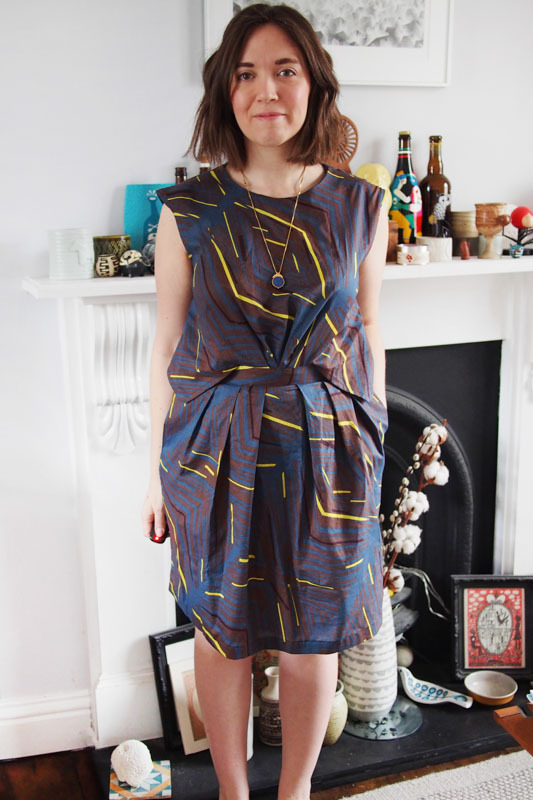 The pear print polyester is from eBay – it’s a very nice poly, with a heavy silky drape and completely opaque so no need to worry about lining. It was definitely harder to work with than the Japanese cotton I made my first 1395 with – lots of slipping and fraying to contend with. One of those fabrics when you heave a sigh of relief as each raw edge gets finished or enclosed, you know what I mean?! Spray starch was my saviour. I’m pleased this dress turned out how I imagined, and it got its first wear last night on the lovely Sally‘s Spoolettes hen night. I can see it being regularly pulled out for weddings and family events too. As I mentioned, another one of these is in the works right now using a more daytime-appropriate double gauze. 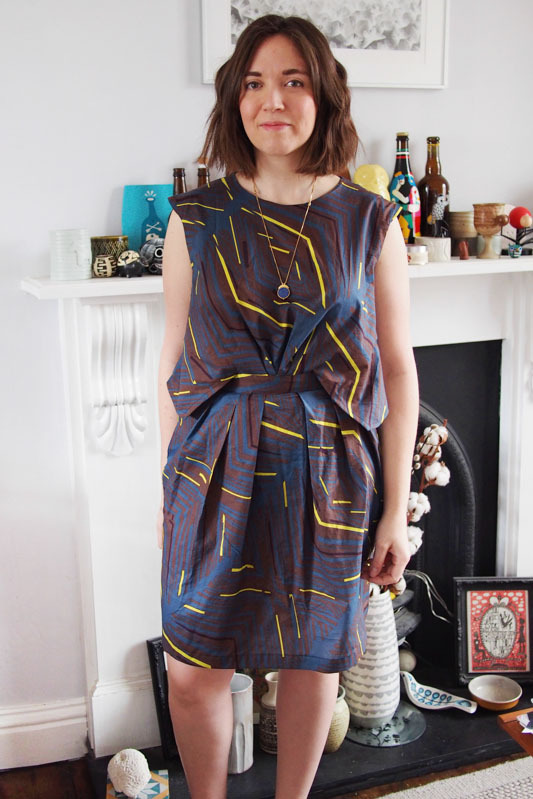 I do love a TNT, especially one so fun to both make and wear! 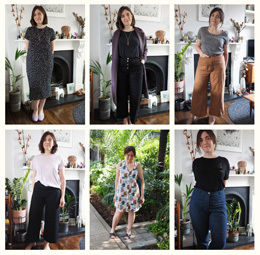 I think I mentioned a while ago that earlier this year the lovely Cloth House sent me a dreamy bundle of their Japanese cottons and crepes. I’ve been hoarding it all since January, anxious to pick the right project for every piece to ensure it’s used to its best potential. Eventually I had a breakthrough and cut into the first one, and this is the result. It’s a Vogue 1395, a pattern I’ve had on my radar for a while after seeing Morgan and Lauren‘s gorgeous versions. I grabbed it in Minerva‘s half price Vogue sale and realised it’d be a perfect match for the Paintbox cotton because both remind me of Japanese kimono. Hence why I decided to get outside and pose next to our lovely baby Japanese maple tree, which always pops back into bloom every spring. 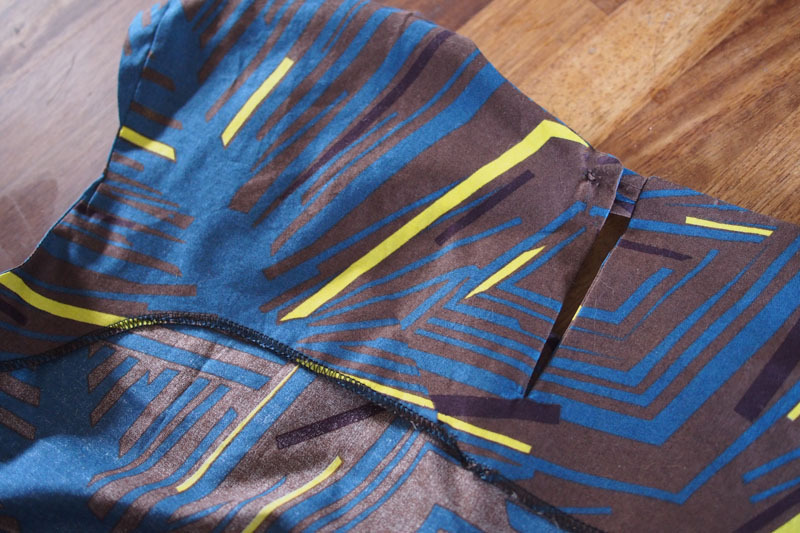 Dream fabric and a cool pattern: making this up was definitely pure sewing joy. 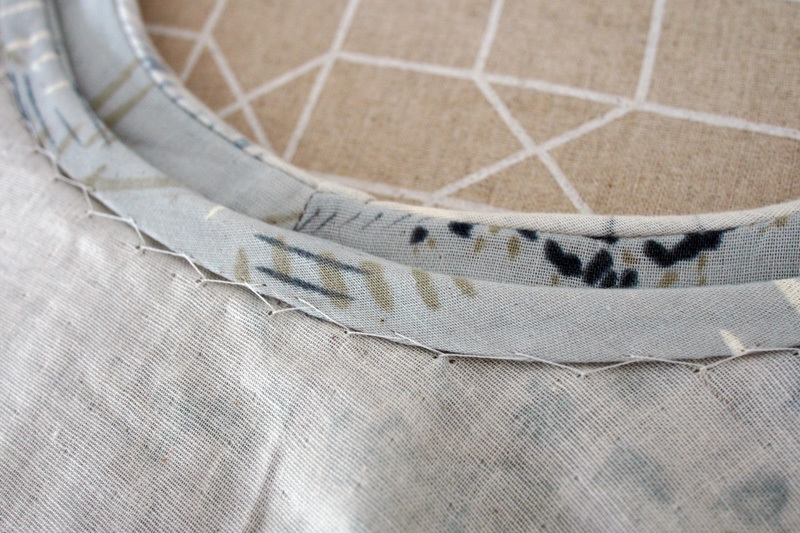 I’ve come to realise that my favourite types of project are ones where the sewing itself is quite straightforward but the construction is a little leftfield, with a bit of trickery or challenge thrown in. 1395 definitely fulfils that with its double-layered back bodice, the over-layer of which wraps to the front to form the waist ties. I’m not lying when I say this fabric is probably the nicest I’ve ever sewn with or worn. It’s got a slightly textured seersucker type of weave and while it took a press like a dream it barely creases with wear. Magic fabric! 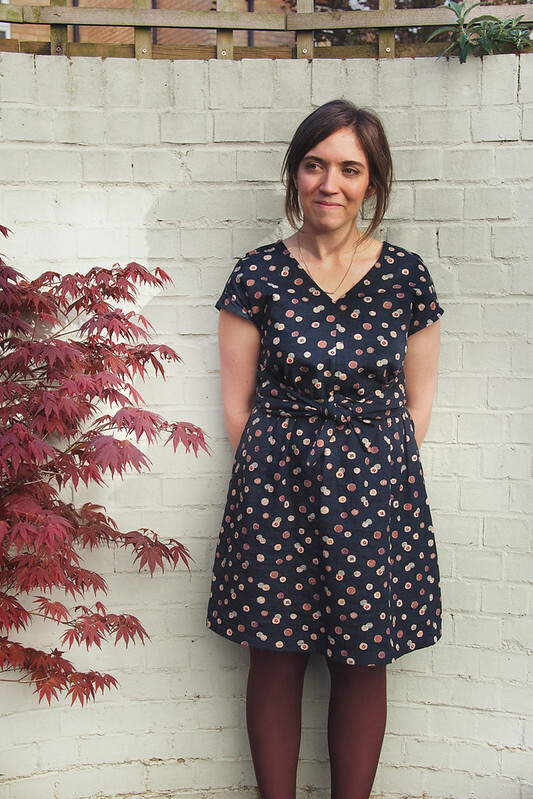 I’m even considering investing in the black colourway for another frock. I made several flat pattern alterations based on how Big 4s always fit me. I cut a size below my measurements all over, shortened the bodice (perhaps half an inch too much in retrospect), took neckline wedges out, and cut the very smallest size through the shoulder. I still needed to shave more off the shoulder seam towards the edge because the sleeves were winging out weirdly, but overall I’m pleased with how the fit turned out. It’s supposed to be blousy and elasticated at the waist so you can’t really go too wrong. 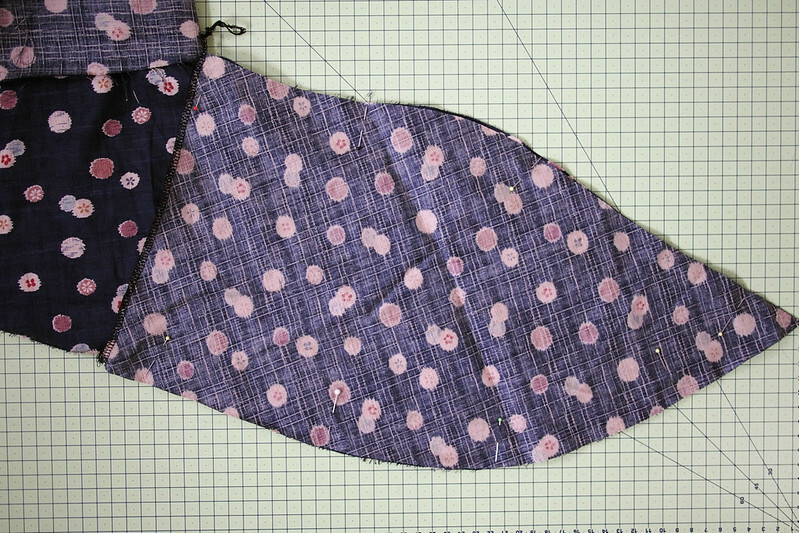 For once I found the instructions were in a pretty sensible order so I did mostly follow them (except the weird direction to double-stitch every seam – I did French instead), but one change I made was to create a sort of facing piece for the ties. In the instructions they’re just roll-hemmed, but the back side of my fabric is pretty obvious looking so I wanted a neater finish that would only show the right side. This was quite straightforward – I just traced off the shape of the tie, cutting it off around the side seam point, sewed it RS together to the overlay and turned to the outside. The rest of the overlay hem is then finished with bias binding. 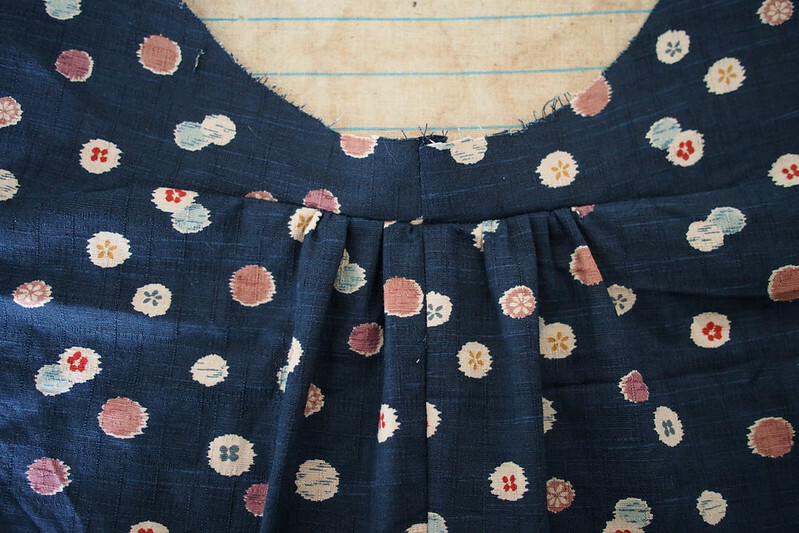 Here’s another yummy detail, a gathered portion at the back neck that’s made by cutting a horizontal slit, seaming above and below it, then gathering and sewing the slit shut. 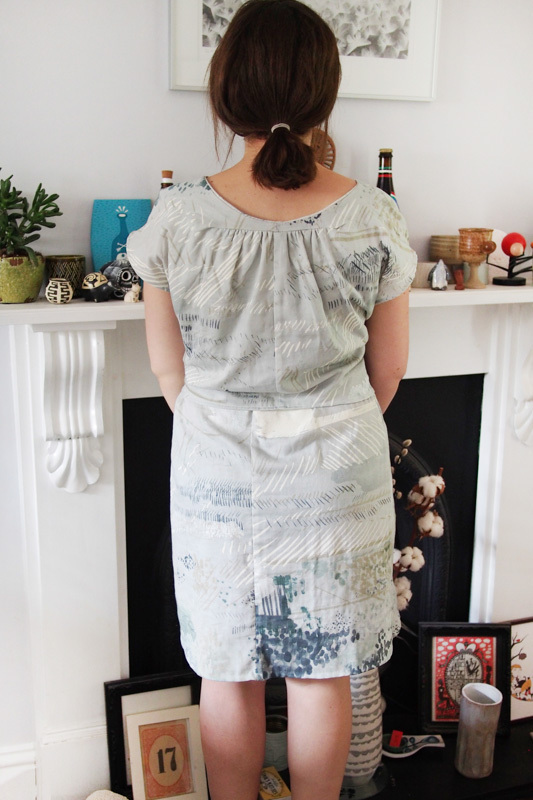 The whole back with the ties undone – the top layer is just caught in the waist seam at the centre back. 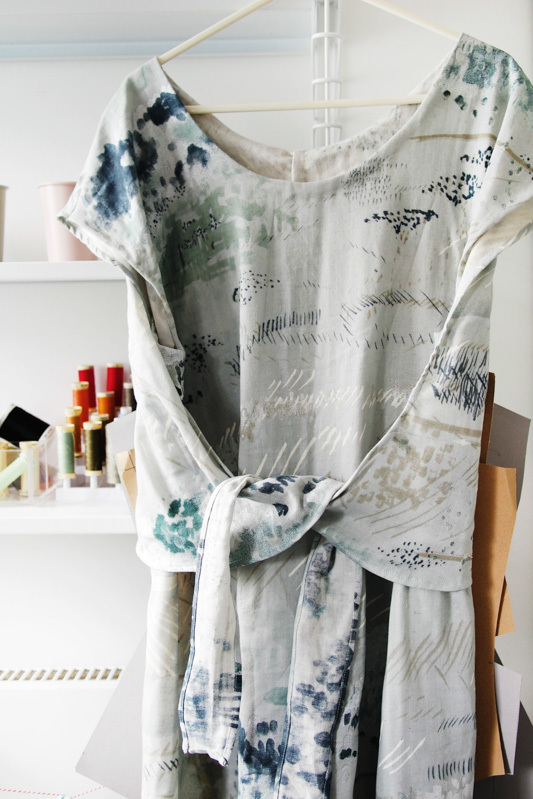 I just love this dress as an object, I keep looking at it and petting it. Dork. 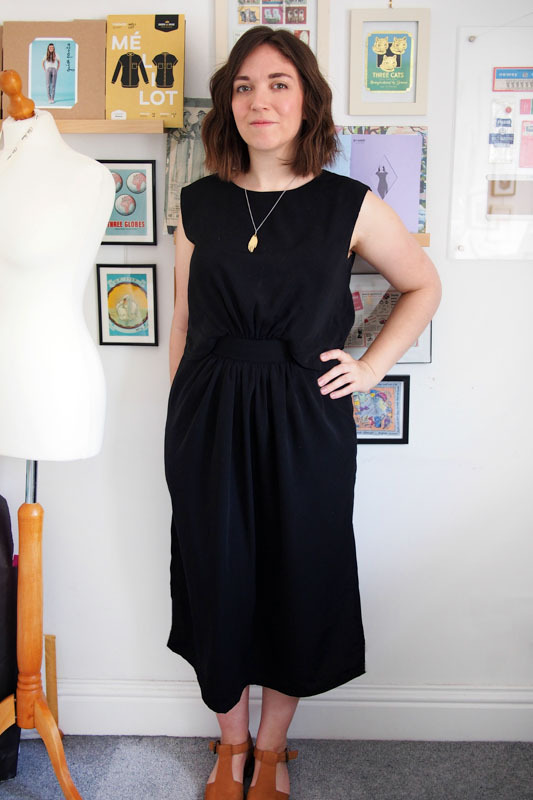 As you can probably tell, I’m digging this dress and I reckon I’ll make more 1395s with a few little tweaks: make the ties slimmer and longer because they feel kind of stumpy, try a curved scoop neckline, and try a more drapey fabric for a different effect – perhaps even a knit. 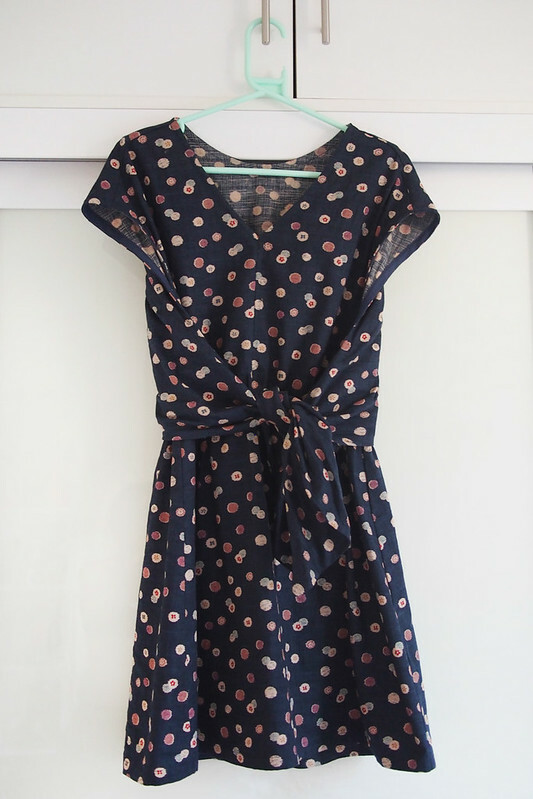 You could even omit the top layer completely for a simple elastic-waist dress. Well on its way to becoming a TnT I think!